Tonight's Event NOW OPEN TO EVERYONE! Child Star Panel TEO HALM, BELLA KING, CHINA ANNE McCLAIN & MORE! You are here:Home-CHILD STAR STYLE, RESOURCES (For Your Actor), Special Appearances, The Actors Fund Looking Ahead Program, THE BUZZ-Tonight's Event NOW OPEN TO EVERYONE! Child Star Panel TEO HALM, BELLA KING, CHINA ANNE McCLAIN & MORE! UPDATE: Great News! TONIGHT’s Child Star Panel is OPEN to UNION & NON-UNION kids and their families too & it’s FREE! And EVEN MORE STARS have been added! Don’t Miss Out On This AMAZING Night! Wouldn’t it be nice for your child actor to have the opportunity to be in an intimate, casual setting with one, two – no SIX talented child stars, and to be able to listen to their stories of success and then ask them questions about their careers? Yea, we thought so too. If your child is an actor or aspiring actor (regardless of union status) this is your chance to take advantage of exactly that opportunity! And just think, what an amazing childhood memory for each of our kids to carry with them. SAG/AFTRA members, Non Union Kids and Looking Ahead Program members, please join in to learn what these talented, child actors have to say about navigating the entertainment industry from their unique young perspective. The Screen Actors Guild Foundation provides vital assistance and educational programming to the professionals of SAG-AFTRA while serving the public at large through its signature children’s literacy programs. sagfoundation.org. The Looking Ahead Program, an innovative program of The Actors Fund, guides and supports young performers age 9-18 years of age as they transition into adulthood. By Editor Tracy Bobbitt|2019-01-22T19:07:55-07:00October 25th, 2014|Categories: CHILD STAR STYLE, RESOURCES (For Your Actor), Special Appearances, The Actors Fund Looking Ahead Program, THE BUZZ|Tags: BELLA KING, Child Actor, CHILD ACTORS, child star panel, child stars, China Anne McClain, Disney child star, disney child stars, Earth to Echo, free events for child actors, katherine mcnamara, looking ahead program, SAG AFTRA, sag foundation actors center, Sloane Morgan Siegel, Taylor Spreitler, Teo Halm, The Screen Actors Guild Foundation|Comments Off on Tonight's Event NOW OPEN TO EVERYONE! 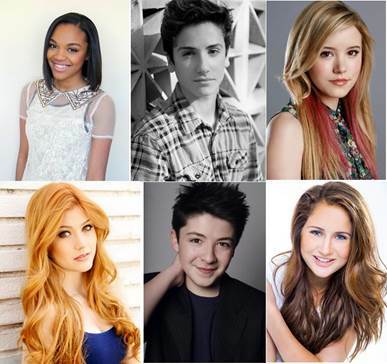 Child Star Panel TEO HALM, BELLA KING, CHINA ANNE McCLAIN & MORE!